Confession: I used 90% of this product up using the wrong method. I mean, entirely the wrong technique. I thought that this scrub was absolutely pointless – it was dry, crumbly, most of it fell off my skin and landed in the bottom of the shower, which is one of my absolute pet hates. It wasn’t until I spoke to somebody at a totally different brand about their scrub (dry, crumbly, most of it falling off skin into shower) that I was shown the error of my ways. Because I had been too hasty, you see, too eager just to slather it on and rinse it back off again. These luxury salt scrubs need a little more care and attention, but BOY are the results good if you follow instructions! 1) Step into the shower briefly to dampen skin. If you’re in the bath then stand up and let yourself dry for a few seconds. 2) Press a small handful of scrub between your hands and, using one hand as a ‘catcher’ for the bits that will inevitably fall down, begin to massage the scrub into your skin with the palm of your hands. You need to keep alert and really press the scrub onto the skin before moving it about too much. The dampness of the skin helps the scrub to stick, but you have to lend a hand! Literally. If you just scoop it out and smash it on (me, usually) then it will just all fall off. 3) Once you have got going on bottom, thighs and tummy (my main areas, because I like to use a scrub to increase circulation as well as smoothing my skin) then you can start taking the excess product and working it down the legs and up over the shoulders and arms. You need to be pretty firm, but always paying attention to the consistency of the scrub – if it’s too dry, it will fall off, if it’s too wet, it’ll slide off. 4) Once your whole body is covered with scrub, you can start your workout routine. Big long sweeps with the hands, circular motions on the bottom and thighs, frantic, crazy movements on the elbows and knees. (Because we all do that.) Be careful on the chest and neck – I actually avoid those areas and use my facial exfoliator instead – I find body scrubs too harsh. 5) Once you’ve had a good few minutes (and it’s worth putting the time in!) you can rinse. 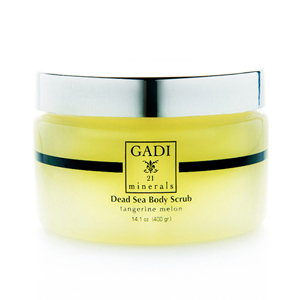 The Gadi Dead Sea Body Scrub is more of a scrub and moisturising treatment in one – the salt has been infused with oils, and the oils remain on the skin after rinsing. I know that loads of scrubs claim to do this, but this one actually does leave your skin oily. It’s borderline weird, actually, because even if you use a showergel afterwards, the oils stick around. If you’re after a luxurious all-in-one, then this won’t disappoint. I’d go so far as to say that it’s the best scrub I’ve used in a while, results-wise. The Tangerine-Melon scent isn’t too overpowering, but gives the treatment a zingy freshness. Why, oh why, oh why, oh why didn’t I work out how to use this properly in the first place? I’m down to the last scraps and virtually weeping at the amount that must have gone flying down my plughole! The good news is that you don’t need to use huge great dollops at a time – if you work it in gradually as I have instructed, you can get by on surprisingly little!